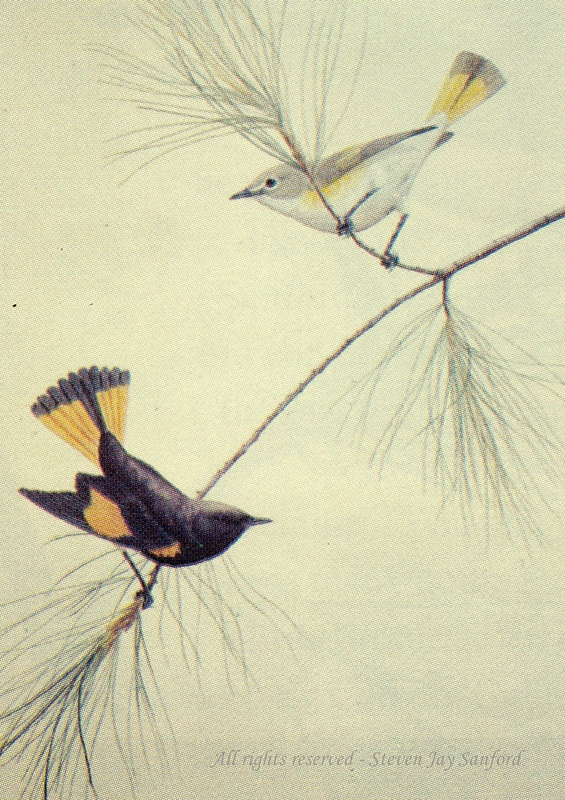 Here are some images – scans from the pages of a 35-year-old magazine – of paintings that were published in Adirondack Life. 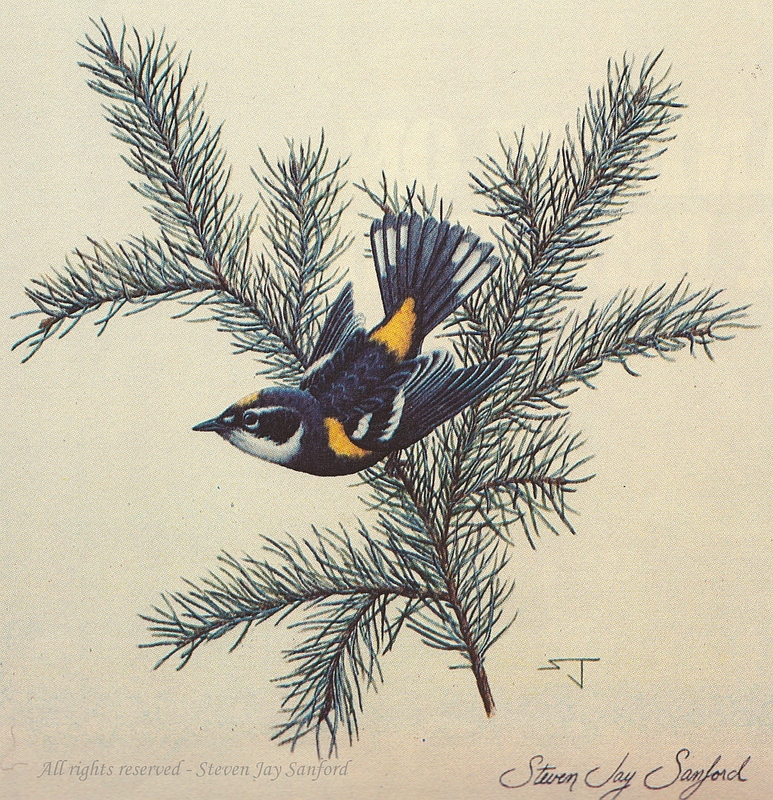 These were presented as “The Birds of Steven Jay Sanford” in the June 1978 issue – the same time I started my career as a Wildlife Ecologist with NYS Department of Environmental Conservation. I had been painting steadily for the previous couple of years but then began my chosen profession on a permanent basis – finally. As it turned out, my profession was too demanding to allow for more painting at this level of effort. Although I have carved and painted throughout the years of my conservation career, my efforts have had to be somewhat less time-intensive. 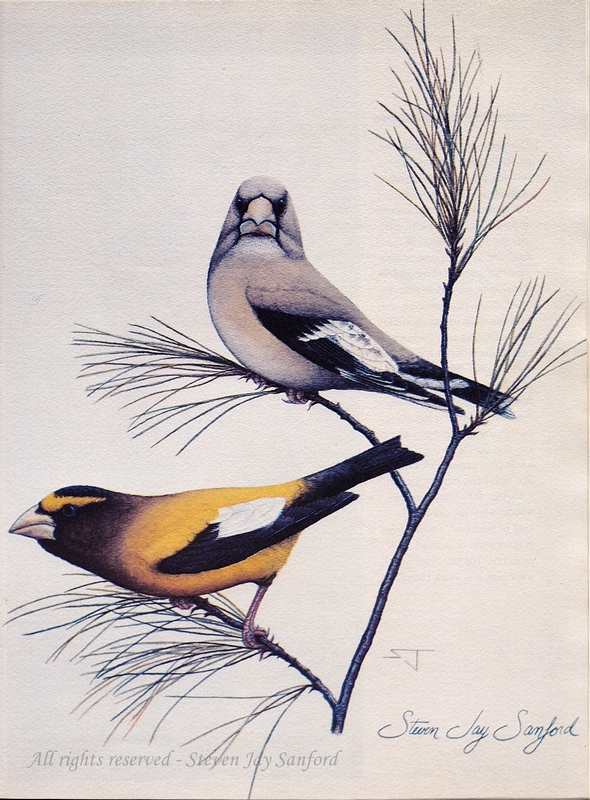 These Evening Grosbeaks remain among my favorite paintings. 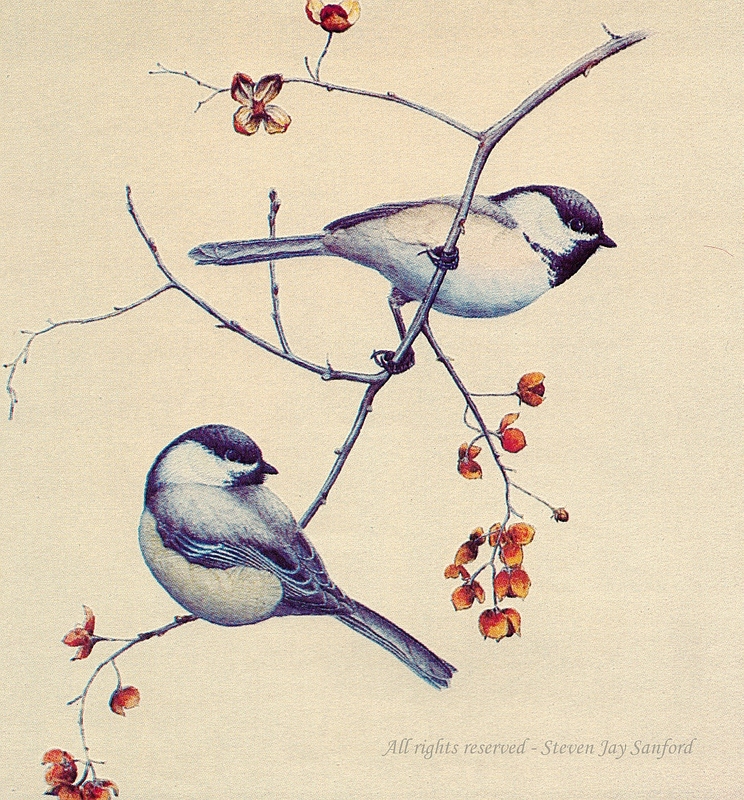 The birds themselves have so much presence that I could not help but have one – the female – stare right at the viewer. 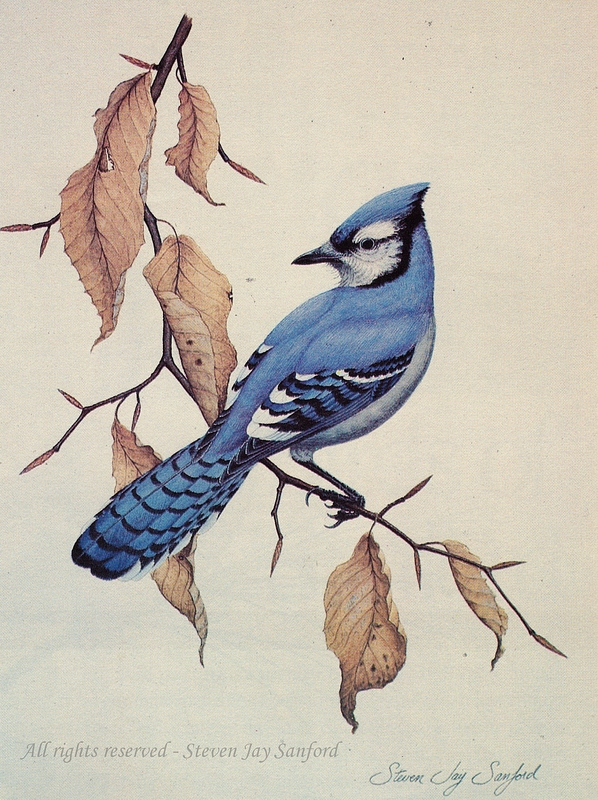 These paintings were each done in the traditional medium of bird illustrators: a very dry watercolor technique. Each piece would be completed over the course of a week – with the actual drawing and painting taking at least 20 hours at my drawing table. I spent lots of time observing birds from life, but – whenever possible – the challenge of accurately drawing any bird was much easier if I had a specimen in hand. Portraying the plant life was as much fun as – and really quite a bit easier than – portraying the birds. I recall that my college botany professor got interested in plants the same way I did. 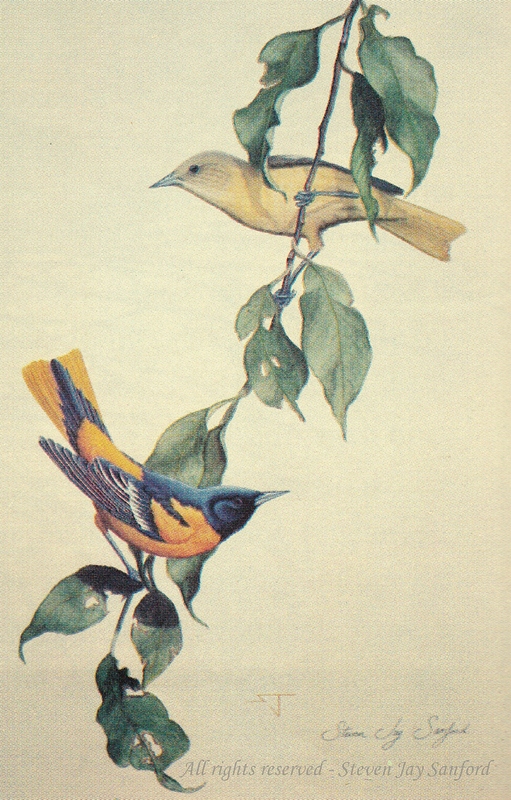 We both started out with a passion for birds, then wanted to know more about “that tree” or “that flower” or “that shrub” it was using – and probably relied upon for some aspect of its life. My conservation career followed a similar path, first protecting the birds (or other wildlife) and then their habitats. Timeless portraits.Classy in every way.